"I think we should move away some." The prospect of being struck by lightning is a terrifying one, but few have come so close to it without being struck themselves as one lucky Norwegian man. In a video recently uploaded to YouTube, 38-year-old Daniel Modøl was filming a far away lightning storm on his phone at his home in Gjerstad, when the storm suddenly came a little to close for comfort, reports TV2 Norway. “It was flashing on the horizon, so I stood outside on the patio and filmed,” says Modøl. 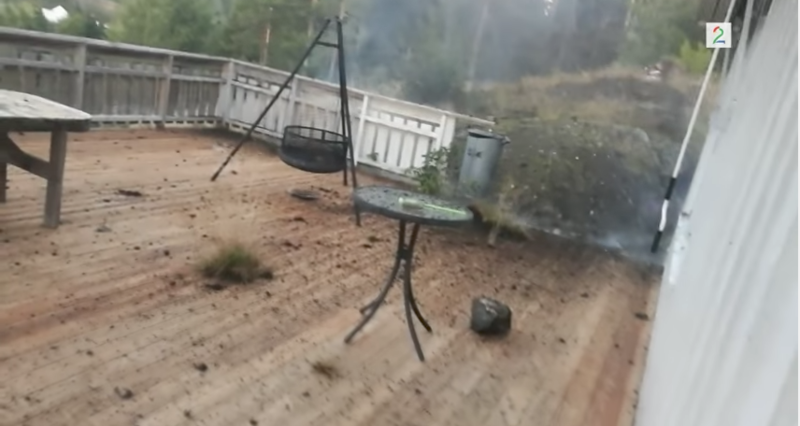 He was filming on his porch when suddenly, a lighting bolt struck the other end of his patio. The intense heat of the bolt left the wood around where it struck singed and burnt, and the force of the impact sent small pieces of the porch flying into the air. It burnt a large patch of the grass in the backyard, leaving it a smoldering heap. Lightning strikes occur across the world, all the time, but they can still be incredibly shocking when seen up close. Websites like Lightning Maps chart real time lightening strikes across the world as they occur. While lightning strikes constantly, it is still very rare for people to be killed by it. In any given year the odds that someone in the U.S. will be struck by lightning is 1 in 700,000. Of those people, 10% of victims will die from the strike, but more than 70% will suffer lifelong adverse health effects. So watch out when you’re outside in a thunderstorm, or in conditions for flash-lightning, but don’t be too worried, Americans are much more likely to die from car accidents and injuries incurred inside the house than by lightning strike. Next, check out this image of lightning striking in Chicago. Then, read about the effect that a lightning strike has on the human body.